MoonMarble.com - *David Shatto - "Black & Silver Flecked Dichroic Spiral"
Art Glass → Contemporary Handmade Marbles → *David Shatto - "Black & Silver Flecked Dichroic Spiral"
This is a handmade marble by David Shatto, who is one of our resident marble making artists. David makes all of his marbles during demonstrations that he gives to crowds of visitors at the Moon Marble Company. 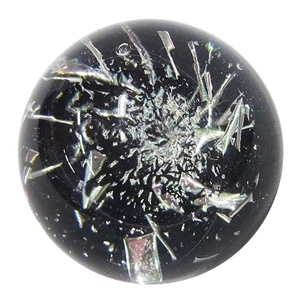 This is a clear marble containing a spiral of silver flecks of sparkly dichroic glass. When you look at the marble from the side you can see the spiral contained in a clear marble, but from the top it is set off against a black background. Approximately 1 3/8" in diameter. Signed and dated.